DC Universe’s Doom Patrol isn’t a show that hates itself—it hates the very concept of idyllic superheroes. A hero’s seeming perfection, good looks, and general amiability are all just distractions, Doom Patrol posits, from what really matters: the fact that being exceptional and extraordinary means that the world is never really going to love or understand you. Each of Doom Patrol’s heroes has origins deeply rooted in tragedy. Unlike the Titans, for example, their meta-humanity isn’t something that any of them see as something that’s made their lives objectively better. For all of them, being exceptional means having to live on the edges of society, where the things that make them strong and unique can’t be seen by the outside world. Body horror has always been one of the stronger bits of subtext that define a lot of modern-day adaptations of superhero stories, but Doom Patrol makes it a core part of its story and never lets you forget that it’s intertwined with the everyday lives of its heroes. Unlike Charles Xavier’s earliest students, each of the Chief’s (Timothy Dalton) charges first came to him in moments where they were certain their lives were soon to be over. Rita Farr (April Bowlby), is a glamour queen of the 1950s silver screen before she suddenly becomes a gelatinous blob monster after being exposed to a mysterious substance during an on-set accident. Hotshot jet fighter pilot Larry Trainor (Matt Bomer) walks through the world wrapped in bandages after a freak accident leaves him disfigured and technically possessed by an interdimensional spirit that sometimes takes control of his body. Race car driver Cliff Stelle (Brendan Fraser) becomes Robotman after his body is left mangled from an accident and the Chief places his brain into a clunky mechanical body. Jane (Diane Guerrero) has as many superpowers as she does personalities, and her shifting moods make it difficult for the other members of the team to really get to know who she is, what she wants, and how dangerous she might be at any given moment. Every single one of them understands just how easy it would be for them to slip up and let their powers get out of control. They also understand how their differences make it so they could never blend into normal society, and so they live at the Chief’s estate as pseudo-prisoners by their own choice. 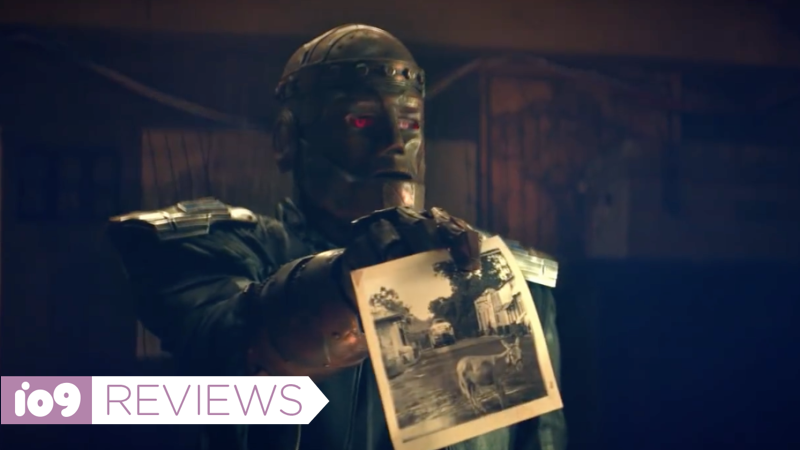 At one point in Doom Patrol’s premiere episode, Robotman explains that he can no longer feel pain in his metal body and he lashes out at the Chief for subjecting him to a life utterly devoid of one of the most important parts of his humanity. Flawed as Cliff was, he was a person who was in the process of living his life, and while the Chief was able to keep him alive, that’s not something the Chief can properly give back to him. The bittersweetness of Robotman’s life is the energy that binds Doom Patrol’s cast together. Objectively speaking, they’re all supremely fucked in terms of living normal lives, but each of Doom Patrol’s heroes knows that courageous vigilantism is part of their futures. Doom Patrol’s very much a show about a ragtag group of social outcasts saving the world, the series dedicates a substantial amount of time conveying to us just how difficult the team’s powers make it for them to function in the most basic sense. While they become very concerned with the town-disappearing threat of Mr. Nobody (Alan Tudyk), their own oddities are really the thing they’re all trying to get a handle on. That being said, the series also homes in on what it is about each member of the group’s idiosyncrasies that make them work as a family as opposed to a team. Robotman’s longing for his family contrasts with Rita’s desire to stay cooped up in her room watching her old films, and Jane meets Larry’s resolute expressiveness with a variety of emotions that all boil down to one form of disdain or another. Wildly different as they are from one another, the oppositional personalities of the Chief’s charges have a way of bringing out their peers’ humanity, and that’s what pulls them together as heroes, though none of them really see themselves that way. Because the DC Universe streaming service is populated with teams of burgeoning heroes who are all so sure of themselves, Doom Patrol stands out. Nobody on the Doom Patrol verbalizes how much they don’t want to be superheroes, but it’s written all over each of their faces. They’re a group of people who’ve been supremely put upon by fate, and rather than taking it all in good stride like proper heroes, they’re upset. They’re angry, broken, and unsure of just who or what it is exactly they’re meant to be—and it makes them all riveting to watch.